The shot was perfect, I knew that when I heard the crack of the 243 down at Kade’s stand. I met him walking back, with a disgruntled look on his face. “You were right, he ran right into the briar patch,” said the 13 year old youth hunter. Well not quite, the small doe went a good one hundred yards through some nasty brush but we were able to find it, following a scant bood trail with a flash light. Well so much for perfect shot placement, time to use enough gun. After seeing the results of the 243 over and over again I just can’t recommend it for anything bigger than a coyote, remembering I had to shoot a coyote 4 times with one, on a New Mexico hunt. I won’t even talk about the jackrabbit I had to shoot twice with one, perhaps a fluke. Keaton and His Specialy Modified Youth Model RifleWell of course it doesn’t kick so the 243 is very popular with youth hunters and females. So if you use one better get good at tracking, while you should set up for a 100 yard run after the hit. The other alternative is a neck or spine shot which will anchor a deer with a 243, however youth hunters or any new hunter is generally not taught to do this. That makes the 243 Winchester rifle more of a sharpshooters rifle than one for beginners. Moving up to the 25 calibers you have a much better selection of effectiveness. Here you have the 257 Roberts, the 25 Winchester Super Short Magnum, and the 25-06, none are hard on the shoulder and all are better than the 243. That little increase in bullet diameter coupled with about 20 grains more lead, wouldn’t seem like much, but in the field there is a marked difference in performance. Two popular light deer cartridges are the old 6.5X55 Swedish and the new 6.5 Remington both are excellent for the light rifle hunter and you won’t be able to tell the difference in recoil from one of them from the 243. Just for the record it’s not the kick, but the muzzle blast that instills fear in new shooters. Remington has reduced recoil loads for most of the mentioned calibers here that decreases recoil even more, in case we have to build up to the gun. Here are the upper level and the top choices if they can be handled by the individual shooter. I say this already knowing if you have the average female or youth hunter at the bench and hand them a 243 and then a 7mm-08 in identical rifles, they won’t be able to tell the difference. So the 7mm-08 gets my top review, but there are two more little 7s that are right in there. Kelton gets help with his deer rifle from his dad Lee SmithThe lightest rifle I’ve ever seen is a Thompson Contender Carbine in 7X30 Waters. I gave one to Kelton Smith, a 13 year old hunter from Rosepine Louisiana. 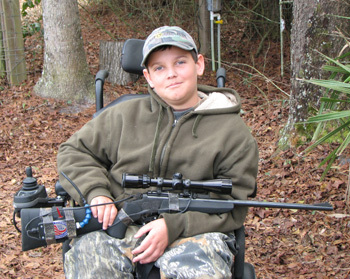 Now Kelton is not your average youth hunter. 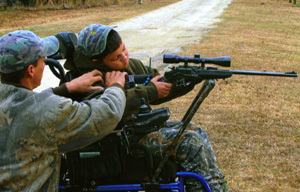 Oh, he can shoot with the best of them but muscular dystrophy keeps him confined to a wheelchair, along with the fact he has to use a sip trigger devise to fire the rifle. Neither the recoil nor the muzzle blast is a factor with him; just ask the trophy ram and wild hog he bagged. My partner Dave Miller has one of these rifles, even though he looks like a lineman for the Packers, Dave carries this rifle and zaps every deer he shoots with it “dead right there,” indicating time and time again the 7X30 Waters is out of proportions in knock down power from the paper ballistics. The favorite rifle of the wife of Jack O’Conner was Eleanor’s 7X57 Mauser. With it she matched the game taken by the great outdoor writer, who pontificated the use of the 270 Winchester. The 7X57 is almost a dead equal to the 7mm-08 so it turns into a personal choice when choosing a rifle to match the recommended calibers here. If I bought one for myself it would be the Ruger Number 1 light Sporter, but Aunt Sandy would steal it from me so fast I’d never get to use it. Is there such thing as a big bore youth and ladies rifle? You bet there is. First, if you like primitive firearms and need one for Mom, you need go no further than a 45 or 50 caliber black powder rifles. A 150 grain load makes both of them a 444 Marlin, but the 100 grain load equates to a 44 magnum with far less recoil. The “Little Big Man” the 44 magnum it self, invented by the Gun Writer, Elmer Keith as a powerful hand gun cartridge, the famous 44 magnum is a fine woods deer cartridge in a rifle. Field performance is far better than a 30-30 or the 243 in the “DRT” department, and is only limited by trajectory, so keep your deer shots inside 150 yards. As far as noise and recoil, let’s put it this way. If Aunt Sandy shows up at the Fort Polk Range with the now famous H&R handy gun known as “Pink Tiger” there is a riot. The women shooters instantly look at their husbands, in a glare of envy, while they watch Aunt Sandy picking off water bottles all the way out to 200 yards. The single shot versions are also legal in Louisiana and Mississippi during the Primitive Weapon season as a bonus. Sandy uses Hornady 225 grain flex tip “Leverevalution” ammo arguably the finest hunting rounds for the 44 magnum. I have never heard a complaint from a woman or a youth hunter from age 10 on up, about the shoot ability of a 44 magnum. All you will really get is broke from buying the ammo to feed the interest in shooting. Picking the rifle for the hunter is all personal choices as every major manufacture makes a youth rifle in most of these calibers. It is all about fit, prestige and of course economy. They all shoot good and will hit the target. There are others that I didn’t mention like the CZ bolt action carbine in 7.62X39 or even an AR-15 in 6.8 Remington. You won’t hear any complaints about them either. I think if Marlin would create a new cartridge like a rimmed 7mm-08 for the 336 Marlin lever action with Hornady flex tip ammo it would be a great light Eastern Deer rifle, so that goes on my wish list for the Youth and Ladies rifles of the future. Pass it on.